BUILD TO LAST. When you build with Spancrete precast, your structures will stand the test of time. That’s because we’ve been perfecting precast for more than 70 years. Since the beginning, we’ve focused on quality, service and innovation. As a result, our precast systems are faster to install, longer lasting, safer and more sustainable. From virtual design to installation, we’ll work with you to make legendary structures. Best! – Over 12 Million in Use Worldwide. – Patented Face Sweep Promotes Flexibility in Tension and Eliminates Reinforcing Interferences. – Successfully Tested to Full Capacity with ¼” x 2½" Fillet Weld. – 100% Made in the USA. – Stainless Steel and J-Finish Carbon Steel Vector Connectors are in Stock, Ready to Pack and Ship. 1½" Faceplate Offers Abundant Welding Area Tolerances! Visit our website for more information and a complete line of our products. From the smallest office to the largest hospitals and everything in between, Thermomass offers a complete selection of concrete insulation and advanced fiber-composite ties. We’re with you for every step: from preliminary design, to panel detailing, to installation, and final walk-through. That is dedication that no other company can deliver. Not only are we the global leaders in insulated concrete products, we helped found the industry. No company can match our track-record of success. Cook Children’s Medical Center CCMC’s South Tower project is an extraordinary update for one of the busiest pediatric emergency care facilities in the United States. This PCI award-winning expansion extended the hospital’s already impressive capabilities through space for new operating rooms, laboratories, additional intensive care units, a heart center, and special procedure areas. Thermomass partnered with Gate Precast to supply insulated precast panels that would provide an energy-efficient building envelope with long-term thermal resistance and condensation control. The finished panels are extremely durable and perfectly match the natural limestone exterior of the original hospital buildings. Learn more at www.thermomass.com © Copyright 2019 Thermomass. All rights reserved. Photos courtesy of Gate Precast Company. All other product names, logos, and brands are property of their respec�ve owners, have been used for iden�ﬁca�on purposes only, and do not imply endorsement. POSTMASTER:Send address changes to Ascent, Chicago, IL 60606. 200 W. Adams St., Suite 2100, Periodical postage paid at Chicago, IL and Chicago, IL 60606. Design Awards Research aims to develop materials and design for precast insulated wall panels that double the thermal performance and reduce weight by half, without increasing costs. capitalize on precast concrete components to rapidly andBuilders sublime aesthetics taking place in the precast/ complete Canvas Stadium within an extremely aggressive building schedule. prestressed concrete universe. These awards recognize 46 to be 'Nimble' theUniversities full gamut Strive of building categories with a focus on the Precast concrete architectural and structural components help solutions that inspired architects, delighted designers meet the demands of evolving teaching methods. clients, and dazzled the public. Case Study: Florida International University Projects, Miami Located in a High-Velocity Hurricane Zone, FIU turns to precast concrete to build a resilient and beautiful campus. Michael D. Moss discusses the evolution of precast concrete. The interdisciplinary architecture and design firm places a focus on higher education to bolster ideas and buildings that honor broader societal goals. As the demand for on-campus student housing remains high, universities are embracing precast concrete systems as a solution. A residence hall at Fayetteville State University come together in a year thanks to hollow-core concrete slabs, changing the way we design buildings. Village a visual testament to the versatility and complex 	USC News aboutis precast concrete, producers, programs, and projects. architectural design of precast construction. 58	Visit Company Profile:forEnCon www.pci.org Body for Knowledge resources. Lightweight cladding offers extreme flexibility, usability, and efficiency. 70 PCI-Certified Plants Directory 60	State-by-state Continuing Education Opportunities directory of PCI-Certified Plants, including a guide to product groups and categories for reference in upcoming projects. 61	Precast/Prestressed Concrete Design Resources 74 PCI-Certified Visit pci.org forErectors Body ofDirectory Knowledge resources. 	State-by-state directory of PCI-certified plants, including a guide to product groups and categories for reference in upcoming projects. State-by-state directory of PCI-certified erectors, including a guide to classifications and a guide specification for reference in projects. INSIGHT BRIDGING GENERATIONAL GAPS IN THE PRECAST CONCRETE INDUSTRY No matter your age, if you work in any area of precast concrete, you know a large generational gap exists in the industry. It’s common to see a five-generation gap at any producer, providing and allowing for very different skills and values. It is the power of influence within these generations that conveys and changes the attributes important to the organization. Each generation must realize and respect these differences while supporting individuals with differing skills. It is critical that members of the precast concrete industry are able to relate to one another to build strong relationships and solid business foundations. Creating teams or programs that allow for generational cross-training can bridge the generational gaps and foster growth. While relating to others from a social standpoint may be difficult, this ability will create relationships that make it easier for employees to stay connected, especially when teaching or learning difficult subjects like engineering principles and design challenges, or when discussing the company’s future. As we attract the younger generation, it is important to understand that this group promises to challenge and change every aspect of business as we know it. This paradigm shift will create an important opportunity for growth, as these young team members will continue to push for new trends and extend the reach of cutting-edge technology, like three-dimensional printing and robotics. Younger generations will also continue the push for conservation and sustainability, as well as locally sourced products, which will continue to grow the green building trend and energy-efficient designs. Accepting these workers is paramount to the success of the precast community, and it is critical that we recognize their core characteristics and competencies. We must promote precast concrete to attract and retain incoming engineers, construction managers, and innovators. If we allow access to multigenerational teams and employees, they will receive coaching and feedback that will grow their industry knowledge. We must recognize the knowledge and experience of industry veterans while welcoming the creativity and innovation of younger generations. Both can take our industry to the future. Roksana Taghizadeh is a project engineer at EnCon Design in Denver, Colo., and was a judge in this year’s PCI Design Awards. See page 25. Shim It Once and Done. LABOR-SAVING SAVE TIME, AND MONEY! Grove Shims has the perfect shim for every job every time. Looking for the right shim? Grove Shims has the perfect shim for all your shimming needs. With color-coded shims and solid thicknesses, the right shim can be easily applied for perfect alignment. No guesswork or realigning. Our shims save you time and money. Need help? Just ask! We’re here to help. Visit us online to see all of our available solid 4x6 Shims. www.groveshims.com Free Samples are Available Upon Request. Grove Shims is the leading producer of plastic structural shims. We have been in business since 1962, making shims since 1975, our family-owned business provides prompt, personalized attention to each order. In addition to our large line of in-stock shims, we will custom fabricate parts to meet your unique requirements. Unlike many competitors, our shims are solid and do not have hollow voids, so you can depend on them in crucial, load-bearing conditions. HEADLINES The project was designed by GLMV Architecture in Kansas City, Mo., with Reed Construction in Chicago, Ill., serving as general contractor. The project’s 160 precast concrete architectural panels were cast by ATMI Precast in Aurora, Ill. The precast concrete panels feature three colors: white tinted cement, light abrasive blast, and acid etch. Waubonsee Development, an affiliate of ATMI, erected the panels. Office Center Features Cast-In Brick Panels Photo: Walters & Wolf. Construction in Hibbing, Minn., serving as general contractor. Northland Consulting Engineers LLP is the structural engineer for the project, which is owned by the county. Precast concrete producer Wells Concrete manufactured and erected almost 70,000 ft2 of precast concrete components for the center, which include insulated architectural panels, interior shear walls, and elevator shaft walls. Hollow-core bears on structural-steel beams and columns. The panels are 13 in. thick, with a 3-in. architectural exterior wythe, 4 in. of Neopor® GPS (graphite polystyrene), and a 6-in. interior structural wythe. They were cast in Wells’ Albany, Minn., plant, while the hollow-core was fabricated in its Rosemount, Minn., plant. The new Silver Oaks medical office under construction and scheduled to open this spring will contain offices for medical personnel and other support services for the hospital. The project is being clad with load-bearing and non-load-bearing architectural panels clad back to a steel frame. A new 44,900-ft2 Class A office building now under construction features a distinctive exterior consisting of cast-in thin brick on architectural precast concrete panels in a variety of decorative shapes. The four-story building was designed by Korth Sunseri Hagey in San Francisco, Calif., with Devcon Construction Inc. in Milpitas, Calif., serving as general contractor. It is scheduled to open this summer. Walters & Wolf Precast in Fremont, Calif., fabricated the components, which include a variety of decorative arched windows coordinated with the firm’s sister company, Walters & Wolf Glass (WWG). Templates were created by WWG, and the precast concrete units were checked in the shop to ensure proper fit up in the field with the radius window head. The panels, which connect to a cast-inplace concrete frame, feature a saw-tooth brick pattern, while the roof spandrels include a stained precast concrete bullnose. Radiused brick pieces were inset into the panels that were erected at the main entrance. The precast concrete components comprised 328 panels, 220-ft2 two-story column covers, 120-ft2 infill spandrels, 170-ft2 arched spandrels, 220-ft2 roof spandrels, and solder course panels for the archway. Proven to Perform Throughout the Precast Process General Shale’s Old Brick Originals™ feature a tumbled edge and unique rustic appearance, setting us apart from the straight edge, solid color thin brick commonly used on precast projects. Owners and architects value the more realistic, blended, hand-laid look of our thin brick, which harmonizes with historic and industrial style buildings as well as adding a bold design impact to modern building exteriors. precast concrete walls stacked horizontally, insulated precast concrete stair and elevator walls, precast concrete insulated floor slabs, round and square columns, and precast concrete stair risers and landings. Canopy Architecture + Design LLC in Chicago is the architectural firm on the project, which is being developed and constructed by Evergreen Construction Co. in Chicago. CEA&A Structural Engineers is the engineering firm. The precast concrete components for the 45,185-ft2 building were fabricated and erected by Dukane Precast in Naperville, Ill. The components were cast from August to October 2018, with erection completed in December. Interior finishing is now underway. The envelope features 87,000 ft2 of 10and 12-in.-thick insulated composite precast concrete wall panels and flooring, which consist of the company’s own 8-in. foam-insulated slabs. A variety of other pieces, including about 140 ft of 24- and 12-in. round columns and some rectangular columns, also were created. In all, 321 pieces were cast, comprising 357 wall and floor slabs plus 18 stair risers and 18 stair landings. The exterior wall panels feature some cast-in formliner details, along with decorative round columns. A formliner producing a 1-in. sinewave was used for the northeast corner, while a formliner creating random ½-in.-deep reveal patterns was used on the first floor on the north and east elevations to add visual interest. A 2-in. depression on the lower level panels extends from 12 to 10 in. thick as an architectural accent. The exterior was cast with a smooth form finish with the intent to paint it once the project is completed. The new Milton Avenue Parking Deck nearing completion in the downtown Alpharetta, Ga., area was designed to blend with the surroundings of the busy retail area. Featuring first-floor retail space of its own, the deck is a total–precast concrete structure, including brick-faced architectural wall panels that cleverly disguise its function and complement the neighboring old town architecture. Designed by TreanorHL in Atlanta, Ga., the 72,000-ft2 parking deck features uniformly spaced openings that mimic the appearance of the local commercial buildings. The brick-faced panels, complete with separately attached cornices, provide the traditional appearance of the surrounding area architecture. The general contractor is The Christman Company, Greensboro, N.C.; Walker Consultants in Charlotte, N.C., serves as structural engineer. The Georgia Division of The Tindall Corporation in Conley, Ga., fabricated and erected the 279 building components. The products include factory-topped double tees, 8- and 12-in. architectural panels with inset brick, cornices and caps, columns, beams, shear walls, wall panels, and stairs. The biggest challenge was fitting the building into its surroundings, according to a Tindall official. The company worked closely with the designer, contractor, and engineer to review options to meet the functional needs while ensuring the aesthetic requirements would be achieved. its stormwater product line and promoted Jay Holtz to the newly created role of director of regulatory management to lead that team. Oldcastle created the team to enhance the regulatory environment for stormwater treatment and storage products and to support continued growth of this product line. Holtz previously served as director of engineering at Oldcastle and has worked for several firms associated with the design and application of stormwater treatment and storage systems, including Peter Kiewit Construction, CH2M Hill, and Clean Water Services. Spancrete has promoted Jeff Winters to executive vice president. With the company since 2015, Winters has more than 20 years of experience in the precast concrete industry, including managing plants where he analyzed business needs and identified opportunities. He will be based at the company’s headquarters and oversee operations across the company, including precast concrete plants in Valders, Wis.; Crystal Lake, Ill.; and Sebring, Fla.
PCI has released the PCI Mobile App in the Apple and Google Play stores. The app can be used to view information about PCI’s participation at trade shows and to personalize sessions, connect with attendees, and view exhibitor information at PCI’s annual Convention and The Precast Show. To download the app, go to https://pci. mosaic-mobile.net/share-app.aspx, or the scan the QR code shown here. Submit your headline news for consideration in a future issue of Ascent to Tom Bagsarian at tbagsarian@pci.org. In 2017, the Precast/Prestressed Concrete Institute published the eighth edition of the PCI Design Handbook: Precast and Prestressed Concrete (MNL-120-17). While the committee devoted significant effort to providing an accurate document, some errata have been discovered. The approved errata have been posted on PCI’s website and are intended to supplement, revise, or clarify the information in the handbook. The errata PDF file can be downloaded from PCI’s website. Click on Guides and Manuals under the Design Resources tab at pci.org. Michael Johnson has been named executive director of PCI of Illinois & Wisconsin. He has more than 13 years of experience in the precast/prestressed concrete industry in Illinois, having worked in sales, marketing, and quality control in many categories, including prestressed bridge beams, sound walls, retaining wall systems, double-tee beams, and precast concrete building systems. Other concrete experience includes working in materials testing for almost seven years and owning a small contracting business. Most recently, Johnson served as a research engineer at the Illinois Center for Transportation in Rantoul (part of the University of Illinois Department of Civil Engineering), where he worked on transportation and pavement research projects. He can be reached at mike.johnson@PCIIW.org and (815) 404-4690.
estimating, and training. He has spent 28 years in various positions with High Concrete Group, as well as with Universal Concrete Products and Nitterhouse Concrete Products. He most recently was senior project manager with Parking Garage Preservations in Lincoln University, Pa. He can be reached at info@pci-ma.org or (610) 467-8558. PCI has hired Mike Smith as senior manager, Business Technology. Smith will develop and maintain PCI’s technology platforms and databases, provide ongoing support for PCI’s Institute for the Management of Information Systems (IMIS) programs and assist PCI’s IMIS project manager as a liaison with IMIS third-party providers. Smith has more than 15 years of database and application development experience with nonprofit associations. The new Specification for Fire Resistance of Precast/Prestressed Concrete (PCI 124-18), will be referenced in the 2021 International Building Code. Published in October 2018, it is available in hardcopy and e-book formats from the PCI bookstore at pci.org. This is PCI’s first specification since becoming an Accredited Standards Developer with the American National Standards Institute in 2014. PCI first issued a manual on fire-resistance design for precast/prestressed concrete in 1977. A second edition was prepared in 1989 and a third in 2011. Although the PCI fire design manual MNL124 was not a standard, it was referenced in the first edition of the International Building Code in 2000 as being acceptable for prestressed concrete slabs not covered elsewhere. PCI 12418 brings the knowledge of previous MNL-124 documents into standard language. A NEW DIMENSION OF THIN BRICK. More sizes. More textures. Make your spaces move with Endicott thin brick. Experience uninterrupted design throughout your entire project. Endicottâ&#x20AC;&#x2122;s keyback thin brick is manufactured to meet the requirements of ASTM C1088, Exterior Grade, Type TBX, and the more stringent size tolerances of +0" -1/16 required for precast applications. 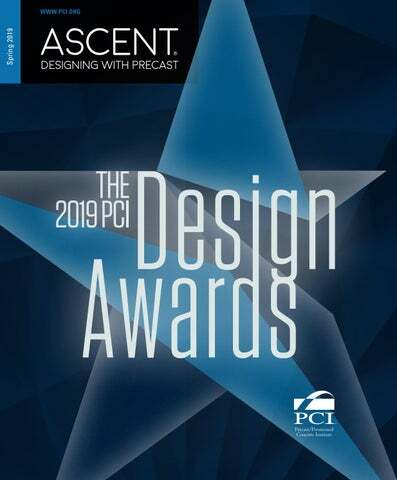 Design Awards THE 2019 PCI DESIGN AWARDS WINNERS PROVE THAT PERSEVERANCE PAYS OFF. As youâ&#x20AC;&#x2122;ll see from the profiles, many of the winning projects did not use precast concrete in the original designs. However, once owners and architects saw the flexibility, cost savings, and accelerated construction times that a precast concrete design could bring to the project, they quickly shifted gears. “An all–precast concrete design simplified construction, reduced costs, and compressed the schedule versus options using traditional masonry or other applied façade material,” says Rob McConnell of Eley Guild Hardy Architects about his all–precast concrete, award-winning University of Mississippi North Parking Structure project. That sentiment was repeated by winners in all categories. Time and again, they used precast concrete materials to create innovative and durable designs. Consider St. John’s Chapel in Columbia, S.D., where precasters used formliners and bright-white precast concrete to create a new building with a clapboard-style façade that looks like a 19th-century prairie church but can withstand decades of blustery Midwestern winters. Similarly, the new student academic center at Florida International University benefits from both the aesthetic flexibility and the strength of precast concrete. The angled precast concrete panels make the building look like it has gills and provide a leaf-like thinness to the façade design; at the same time, the building is durable enough to resist hurricane-force winds. While proving that precast concrete is a superior option to other material choices, this year’s winners have also delivered an eclectic range of projects that showcase the durability, artistry, and cost savings that can be achieved with precast concrete. From a conventional apartment building in an evolving Chicago, Ill., community, to a massive football stadium designed with feedback from thousands of Texas A&M University sports fans, all of the winners took their precast concrete designs in new directions to meet the needs of their customers and the community. Our jury of experts picked winners from an impressive field of applicants, ensuring the top picks really are impressive. The following pages showcase all of the projects selected by our judges. All of the winners took their precast concrete designs in new directions to meet the needs of their customers and the community. JURY John Circenis principal, Gensler, Los Angeles, Calif.
John Circenis is an architect and principal in the Los Angeles, Calif., office of the global design and architecture firm Gensler. He has more than 30 years of experience in architectural design and implementation. As the Southwest regional design realization leader, Circenis has a unique talent for coordinating complicated building systems for large, complex projects such as airports and tall buildings. He served as a technical director on the Shanghai Tower, which is the world’s second tallest building. Circenis’s other notable projects include the Westin DEN Hotel and Transit Center, the Las Vegas Monorail, and the Ritz-Carlton Hotel at LA Live. Circenis is an active member of American Institute of Architects (AIA), serving on the Committee for Building Performance and Regulations. He has a bachelor of science in architecture degree from the Ohio State University. Monty Overstreet vice president and co-owner, FDG INC., Arvada, Colo. Monty Overstreet is vice president and co-owner of FDG, which specializes in the planning and conceptual design of precast concrete structures and provides design, detailing, and project management services. Overstreet has 28 years of experience in precast, prestressed concrete construction and has been a major contributor to some of the largest precast concrete construction projects throughout the United States. Over the past 19 years, he has worked on several high-profile projects, including the Maricopa County Courthouse in Phoenix, Ariz., and the Burns & McDonnell Corporate Campus parking structure in Kansas City, Mo. Most recently, he managed the precast concrete design for the $1.5 billion PennFIRST Patient Pavilion in Philadelphia, Pa., which is slated to open in 2021. Overstreet earned a bachelor’s degree in architectural engineering technology from the University of Southern Mississippi and is a member of both PCI and the University of Southern Mississippi Alumni Association. In 2014, the Glenstone Museum embarked on a major expansion project, adding a 204,000-ft2 building to its already spacious campus. The designers wanted materials of the new structure to evoke a direct connection with the surrounding landscape, while providing a lasting structure that reflects the modern art within the museum, says Travis Fox, vice president of operations for Gate Precast. “Precast concrete block was chosen for its durability and the natural variations and beauty exhibited in each specific panel.” The new structure appears to emerge from the hilly landscape and features a ring of gallery rooms surrounding a large, central water court. The exterior of each room is made of stacked blocks of precast concrete, individually placed to measure 6 ft long, 1 ft high, and 1 ft deep. No color-altering pigment was used in the design, Fox notes. Instead, the placement method and mixture of cement and sand were chosen to produce slight variations in the light-gray color and texture, creating a beautiful, naturalistic design. This finish deliberately contrasts with the smooth precision of the windows, which have been specially engineered using glass panels that are set flush into stainless-steel mullions. 1400 pieces had unique markings, which required considerable coordination in detailing, production, tracking, delivery, and installation. The result is a beautiful, modern structure that is a unique example of the function and attractiveness of precast concrete. “Aesthetics were the primary objective of the architect as it related to precast concrete because the owners wanted to build something lasting and of enduring value,” Cruze says. Through careful coordination and planning, this precast concrete design fit the bill. ALL–PRECAST CONCRETE SOLUTION AWARD Key Project Attributes ❚ Off-site fabrication compressed the on-site construction schedule, minimizing disruptions and avoiding weather delays. ❚ The all–precast concrete design contributes physical resiliency to the structure, while visually communicating a sense of permanence and security to the public. ❚ The envelope features energysaving precast concrete sandwich wall panels with a 2½-in.-thick layer of expanded-polystyrene foam to ensure a continuous insulation R-value of 12. Jacobs Engineering Group, Dallas, Tex. As a senior projects architect and firmwide resource on codes and life safety, Marty Huie is often put in the position of challenging established concepts and synthesizing complicated and sometimes conflicting requirements from clients and the construction trade industry. He works closely with his clients to navigate the regulatory requirements for healthcare facilities, communicate the impact of those requirements on facility designs, and generate innovative design solutions. When he’s not designing structures, Huie educates clients and the design community through one-on-one and association presentations, as well as by writing for recognized industry publications. Huie has served as a National Fire Protection Association (NFPA) Healthcare Subcommittee member since 2004, and he has actively debated code issues on the floor at the NFPA national committee meeting. He has a bachelor of architecture degree from Louisiana Tech University. Roksana Taghizadeh project engineer, EnCon Design, Denver, Colo. Roksana Taghizadeh is a professional structural engineer who specializes in precast/ prestressed concrete design. In her 10 years of industry experience, she has primarily focused on providing design consultant services, and she has acted as the lead project engineer on numerous residential, commercial, and industrial projects. Taghizadeh has been involved with PCI for most of her career, and she participates on several committees. She has completed the Leadership PCI (LPCI) program and is currently chair of the Industry Diversity Committee. She holds a bachelor’s degree in civil engineering from the University of Colorado–Denver, with an emphasis on structural engineering and a minor in German. Engineers Group Inc., Mt. Prospect, ILL. Chris Mosley is a licensed professional engineer and president of The Consulting Engineers Group Inc. (an Illinois corporation). He specializes in the design of precast concrete superstructures of various types. Mosley is currently a member of PCI’s Technical Activities Council, as well as the Building Code and BIM Committees, and is the incoming Professional Member director of PCI’s Board of Directors. He has also served as the chair of the Building Code committee and was a member of the eighth edition Industry Handbook Committee. Mosley has a bachelor’s degree in civil engineering from Tulane University, and a master’s degree in civil engineering from Purdue University. MUSEUM OF FINE ARTS, HOUSTON–GLASSELL SCHOOL OF ART HOUSTON, TEX. Key Project Attributes ❚ Each panel was a true structural member cast 12 in. thick with 100% face mixture. ❚ The longest spans were nearly 45 ft. in length, with nearly all pieces angularly cut to fit the structure. ❚ Precasting allowed for precisely prefabricated load-bearing walls whose finish could be closely controlled. The new Glassell School of Art building in Houston, Tex., is itself a work of art. The defining geometry, sloping plane, and elegant use of light and space all come together in a structure that will be an anchor for the Houston community. Much of the design was made possible through the use of precast concrete, says Olaf Schmidt of Steven Holl Architects. “The precast concrete structural elements hold up the floors and define the exterior, incorporating the angle of the main incline.” The precast concrete façade design alludes to the adjacent sculpture garden walls created by Isamu Noguchi, a noted artist and landscape architect. “The simple planar structural pieces of the sandblasted precast concrete plane give character to the inner spaces of the building in the spirit of simplicity and directness,” Schmidt says. FLEXIBILITY AND CONTROL From a structural perspective, the main challenge on the project was to ensure continuity between the different types of structural components. The building’s geometry is characterized by individual panels that rotate, twist, and incline to varying degrees at random locations, requiring detailed attention to the load path. “The precast concrete walls allowed for precisely prefabricated load-bearing walls whose finish could be closely controlled and was therefore consistent for the entire building,” Schmidt says. The use of precast concrete also allowed for the minimization of wall thickness in some key locations and provided control over placement of the reinforcing steel. Connections between precast concrete panels; cast-in-place, mild steel-reinforced concrete, hollow-core slabs; and post-tensioned concrete are located throughout the structure. “Ensuring that forces transfer properly from one component to another was critical for the structure as a whole,” Schmidt explains. Precast hollow-core concrete slabs frame the floor systems and span between the cast-in-place concrete perimeter beams. “These made a relatively lightweight, longspan floor framing system possible—up to 40-ft-long spans with a depth of only 16 in.—and were surprisingly flexible, allowing for embedded systems and field-installed penetrations,” Schmidt says. The wall panels vary in size and geometry and are spaced along the perimeters so full-height, glazed panels could be installed between adjacent precast concrete panels. This structure of alternating concrete panels and large, translucent panels exposes the internal art studios to diffuse natural light while achieving a distinct external design that draws in passersby. “The precision of the precast concrete panel design allowed for the simultaneous fabrication of the glass windows based on drawings rather than field measurements,” Schmidt notes. The panels all touch each other due to the placement of the glass; therefore, once set, each panel had to be braced and set with a “ring beam” on top. Schmidt emphasizes that the flexibility and performance of precast concrete made the design possible. “Precast concrete for the exterior structure provided a superior finish and consistency over cast-in-place concrete,” he states. PROJECT SIZE: 93,000 ft2 Photos: Photography at Richard Barnes/2018. Key Project Attributes ❚ Architectural precast concrete panels are resistant to moisture. ❚ The continuous, lowpermeability insulation creates a moisture barrier to prevent vapor diffusion and air infiltration. ❚ Multiple mock-ups were produced to ensure that the veining technique would deliver the limestone appearance the architects desired. COOK CHILDREN’S MEDICAL CENTER–SOUTH TOWER FORT WORTH, TEX. In 2014, Cook Children’s Medical Center in Fort Worth, Tex., broke ground on a nine-story addition for the largest pediatric healthcare provider in the Dallas-Fort Worth, Tex., metropolitan area. Building healthcare facilities always comes with a unique set of challenges, says Sean Patrick Nohelty, principal with David M. Schwarz Architects. These buildings must be designed to address the varied needs of patients and staff while meeting the highest standards for air quality, temperature and moisture control, and exterior aesthetics. The strict performance criteria and desire to create a lasting and beautifully designed solution for the community’s most vulnerable patients drew the designers to precast concrete. Precast concrete was selected over a typical masonry design or cast-in-place concrete on a steel frame through “Choosing by Advantages” (CBA), a system in which each factor in the material selection was weighted according to the structural needs of the project and compared to find the best specification. The CBA analysis determined that a precast concrete façade would deliver ideal waterproofing, insulation, and sound transmission, as well as sufficient ceiling space. The precast concrete elements also brought speed and durability to the project and helped keep costs low. All of this was achieved “while still meeting the medical center’s exacting standards for high quality,” Nohelty says. PROJECT SIZE: 314,000 ft2 Photos: Steve Hall of Hall + Merrick. Photos: Rich Montalbano/RiMO Photo, LLC. BEST MULTI-FAMILY BUILDING AND ALL– PRECAST CONCRETE SOLUTION AWARD HONORABLE MENTION Key Project Attributes ❚ Precast concrete panels were cast over the winter and erected in the spring, accelerating construction. ❚ The use of precast concrete helped the buildings earn Energy Star and Enterprise Green Communities certifications. ❚ Highly insulated walls, windows, and roofs deliver energy efficiency, noise reduction, and a durable, low-maintenance design. BEST MIXED-USE BUILDING Key Project Attributes ❚ Modular 3-ft-wide panels wrap the exterior of the building. ❚ The pronounced diamond pattern connects to the Sporting Kansas City’s established branding. ❚ “Rock striations” in the panel design tie to the local geography. READY FOR THE NATIONAL STAGE Precast concrete was not the initial choice for this project, McClure notes. When they designed the building, the architects wanted to use depth, color, and textural variation to express “the movement of the body and the ball,” he says. The design team explored multiple exterior-cladding options, such as fiber-reinforced concrete or fiber-cement panels. But after multiple design iterations and cost estimates for these options, team members determined that they needed another option to stay within budget. “Solid architectural precast concrete panels were the next logical step,” says McClure. The primary design element is the pronounced diamond pattern cast into the precast concrete wall panels. The look was chosen after an extensive mock-up process, in which the precast concrete team filmed a panel for a full day to learn how sun and shadows affected the protrusions in the precast concrete panel design. “Everyone loved it,” McClure says. An acid-etched finish was also used in the entryway of the building for a modern design sensibility, and a sandblasted finish at the field level integrates the design with the landscape. A rain-screen system featuring a wood veneer was added as further complement to the precast concrete panels. Along with delivering the desired visual effect, the use of precast concrete helped the project stay on schedule and budget. As winter approached, “precast concrete contributed to a fast-track delivery method with quick erection times,” McClure explains. Also, precast concrete “offered a cost-effective exterior design solution,” he says. The versatility of precast concrete helped to meet the client’s ultimate goal of creating a unique building whose design feels local to the area but can also stand out on the national stage. “With a client as passionate and involved as the design team was, this facility successfully came to life as a world-class training facility and exceeded all expectations,” McClure says. BEST STADIUM AND ARENA Key Project Attributes ❚ A massive, two-phased stadium redesign project was completed in 26 months without affecting game play at the stadium. ❚ More than 24,000 fans offered feedback that shaped the design and amenities in this $485 million project. ❚ When the stadium was completed in the fall of 2015, it represented the most extensive redevelopment of a collegiate athletic facility in history. PCI-CERTIFIED ERECTOR: Precast Services, Twinsburg, Ohio precastservices.com Photos: Christy Radecic Photography. In 2012, the Christ Hospital Network in Cincinnati, Ohio, decided to add an orthopedic center of excellence to its already nationally renowned healthcare facility. The owners worked with an architect to design the seven-story, 381,000 ft2 LEED Silver-certified Joint & Spine Center, which links directly to the hospital’s existing surgical and imaging areas. As part of the broader master plan, the client and the architect agreed that the design for the Joint & Spine Center needed to reflect the historical red-brick vernacular of the other campus buildings, but it also had to meet strict budget restrictions, deliver a watertight building envelope, and meet the high-performance goals set for the new building. All of these requirements could be met with a precast concrete design. Photo: High Concrete Group LLC and Tom Rossiter. Key Project Attributes ❚ Precast concrete cladding provides a watertight building envelope. ❚ The modular brick veneer was applied using a rubber form liner in a raked pattern, with contrasting panels designed to look like limestone, using a medium acid-etched finish. ❚ The project achieved LEED Silver certification. Project and PrecasT Concrete Scope ❚ Design a seven-story precast concrete brick and cladding faÇade for an expansion to the Christ Hospital Network in Cincinnati, Ohio. ❚ The project features 142,000 ft2 of architectural precast concrete cladding, including spandrels, column covers, and returns. ❚ The 960 precast concrete pieces range from 6 to 22 in. in thickness. LIGHT THE LANTERNS For the exterior of the new center, the designers used precast concrete panels with a thin-brick veneer to rapidly and cost-effectively achieve the desired red-brick design. The modular brick veneer surrounds large, open windows that fill the building with natural light, supporting the building’s sustainable goals and inspiring well-being in visitors to the center. The massing incorporates a projected precast concrete “lantern” element with a limestone appearance at the main entrance, which provides contrast to the brick veneer and further reflects the campus’s historic cupolas. Acid etching was used to complement the modular brick and windows and as a surround for the lantern element, further connecting the building with the campus’s master plan. Internally, the building features a cast-in-place structure on the first two floors and steel frame on the four stories above; however, the precast concrete fabricator was able to upsize the panel design on the OWNER: exterior to decrease the number of panel joints and The Christ Hospital Health Network, Cincinnati, Ohio optimize their location. This technique reduced the PCI-CERTIFIED PRECAST number of crane picks and caulked joints and expeCONCRETE PRODUCER: dited the precast production schedule. High Concrete Group, The precast concrete design also delivered inSpringboro, Ohio highconcrete.com creased efficiency to site logistics, which was imARCHITECT AND portant because the new structure was erected ENGINEER OF RECORD: with an active traffic lane along one side, limiting Skidmore, Owings & Merrill, Chicago, Ill. the amount of construction to only two sides of GENERAL CONTRACTOR: the site at any given time. Messer Construction Company, The final result underscores how precast conCincinnati, Ohio crete construction delivers multiple scheduling, PROJECT COST: $280 million budgeting, and performance benefits without sacrificing architectural vision, especially if supported PROJECT SIZE: 381,000 ft2 by a comprehensive communications and process control plan. The FLOOD project in Omaha, Neb., is a novel example of how precast concrete can be used to transform a community space. The developers took an empty, early-20th-century building and transformed it with an architectural and art installation using precast concrete to educate the community about design, art, architecture, and manufacturing. Unlike permanent museum buildings, which can require massive budgets to build and maintain, this project used the existing urban infrastructure to create a temporary exhibition space. Then, the designers brought in innovative ultra-thin precast concrete panels to serves as the canvas for urban industrial art. PRECAST CONCRETE AS ART Six ultra-thin, 12-ft-wide precast concrete panels were custom designed to meet the needs of this project. Each panels is just 1½ in. thick and weighs approximately 2000 lb—which is roughly one-third lighter than traditional architectural precast concrete panels. However, the precaster was able to deliver comparable levels of strength, durability, and crack resistance through the use of a 5000-psi concrete mix and prestressed, corrosion-resistant stainless-steel wire cables spaced 4 in. apart throughout the panel interiors. A steel erector on a boom was used to load the main-level panels through a storefront window and into the upper level via a fire escape exit door. Once the panels were in the building, the design team established a ½-in.-thick steel plate frame around the border of each panel and applied black waterproofing by OWNER: hand as the art to the canvas. After applying the Standard Development, waterproofing, the team dragged a 10-ft-wide steel Omaha, Neb. plate along the top of the frame on each panel in PCI-CERTIFIED PRECAST CONCRETE PRODUCER AND one move, creating a unique finished texture for ENGINEER OF RECORD: each panel. Enterprise Precast Concrete, Omaha, Neb. When the waterproofing had cured, the erecenterpriseprecast.com tion team used simple rigging equipment to hoist ARCHITECT AND the panels into position and supported them from GENERAL CONTRACTOR: ⅜-in.-diameter cable loops attached to steel Mike Nesbit Studio, Los Angeles, Calif. beams between the existing cast-in-place concrete PCI-CERTIFIED ERECTOR: columns. The result is a remarkable and sublime Patriot Steel Erection, installation that appears to float in air within the Omaha, Neb. original, raw cast-in-place concrete structure of PROJECT COST: $35,000 this historic building. Key Project Attributes ❚ Ultra-thin (1½-in.-thick) precast concrete panels weigh one-third less than conventional panels with the same durability. ❚ To add strength and reduce risk of cracking, 5000-psi concrete and 3/16-in.-diameter prestressed, corrosion-resistant stainless-steel wire cables were used throughout the precast concrete panel interiors. ❚ Panels were suspended using ⅜-in.-diameter cable loops attached to steel beams, so the panels appear to float. Project and PrecasT Concrete Scope ❚ Construct a series of large, concrete “floating” canvases for a temporary industrial art exhibition. ❚ Project included six ultra-thin precast concrete panels weighing roughly 2000 lb each. ❚ Precast concrete erection was completed in one day. LOS ANGELES, CALIF. The new USC Village sits in the heart of southern California, but it resembles an ivy-covered New England university. The five-story, Oxford-inspired project is a multiple building complex designed and built in classic collegiate Gothic architectural style to create a sense of stability and permanence in the community. The designers took advantage of the flexibility and cost-effectiveness of architectural precast concrete to incorporate many facets and intricate details, including extensive use of thin brick set in precast concrete panels and light, sandblasted precast concrete to achieve the stone-look details in the arches and tracery. More than 1.5 million bricks were hand-placed into elastomeric liners, which were made to capture the individual bricks in highly controlled random patterns. Key Project Attributes ❚ Three thousand separate precast concrete pieces were cast into 1050 panels to accelerate erection and cut costs. ❚ Interiors could be constructed much sooner than would have been possible with a traditional brick-and-mortar construction method. ❚ Use of waxed bricks prevented concrete from getting on the face during the placement process. Project and PrecasT Concrete Scope ❚ The project included 1,020 thin-brick wall panels (10 by 30 ft) with over 2000 inset pieces. ❚ The separate window surrounds, cornices, medallions, and other design elements ranged in size from 1 ft2 to 8 by 5 ft. ❚ The entire project was completed in three years, in time for the 2017 fall semester. MANY PIECES, ONE PANEL The use of precast concrete helped the project team meet the extremely tight schedule and fulfill the owner’s desire to minimize the impact of construction on the project site. Along with casting the pieces off-site, the precaster developed a way to place the multiple elements ahead of time and incorporate them into a single panel to further expedite progress. OWNER: The project included 3000 case pieces; however, Capital Construction Development, they were combined at the plant into 1050 wall Los Angeles, Calif. panels with multiple smaller elements, such as PCI-CERTIFIED PRECAST CONCRETE separate tracery window surrounds, cornices, and PRODUCER AND PRECAST CONCRETE SPECIALTY ENGINEER: medallions, inset into larger forms. This strategy Coreslab Structures (L.A.), enabled the team to ship finished panels to the Perris, Calif. coreslab.com site with all of the key design features already inARCHITECT: corporated, rather than having to erect those feaHED, Los Angeles, Calif. tures separately in the field. Reinforcing bar and ENGINEER OF RECORD: other anchors extending from the previously cast KPFF, Los Angeles, Calif. pieces were tied to the panel cages to ensure accuGENERAL CONTRACTOR: rate final positioning before concrete placement. Hathaway Dinwiddie, Los Angeles, Calif. This innovative solution significantly reduced both PROJECT COST: erection time and costs. Overall, the decision to $900 million use precast concrete on this project allowed the PROJECT SIZE: architect to incorporate intricate and nuanced 1.2 million ft2 design details, while providing resilient structures that will last for decades. The new Church of Jesus Christ of Latter-Day Saints Temple in Tucson, Ariz., stands as a welcoming beacon against the surrounding landscape. The designers selected precast concrete at the outset of the project because they knew it would allow them to accommodate many of the design and construction goals within the budget. The temple is one-story building, but the architect wanted the appearance of a taller, more substantial structure. They also envisioned an Art Deco design featuring subtle stepping and textural elements, which they knew they could achieve using precast concrete. STEPPING BACK The final design of the cladding used formed precast concrete panels with Art Deco “stepping-back” detailing that gives the building a sense of height. Ornamentation recessed into the precast concrete panels includes interlocking circles and subtle reference to desert cacti. A deep, three-dimensional (3-D) OWNER: The Church of Jesus Christ raking pattern in the frieze portion of the horiof Latter-day Saints, zontal moldings and bands adds further detail to Salt Lake City, Utah the façade. PCI-CERTIFIED PRECAST CONCRETE PRODUCER: The complex details in the cladding façade Gate Precast Company, contribute to a soaring, elegant structure with a Hillsboro, Tex. gateprecast.com dynamic appearance that shifts as the desert sun PRECAST CONCRETE casts shadows throughout the day. Elements exSPECIALTY ENGINEER: pressed in wood and stone on the interior of the Stehler Structural Engineering, St. Paul, Minn. temple are also mimicked on the exterior using precast concrete and art glass. ARCHITECT: FFKR Architects, Along with delivering the desired design, the Salt Lake City, Utah architect’s choice of precast concrete helped ENGINEER OF RECORD: accommodate the tight construction schedule. ARW Engineers, Ogden, Utah The precast concrete company joined the project GENERAL CONTRACTOR: Big-D Construction, early in the design phase, and the precaster was Salt Lake City, Utah able to use the 3-D model to profile the front and PROJECT SIZE: backside of the panels, which saved time in the 2 38,216 ft shop-drawing phase and expedited the overall construction schedule. Key Project Attributes ❚ A stepping-back design gives the structure a sense of rising and height. ❚ A raking pattern in the frieze and ornamental designs recessed into the precast concrete cladding generate shifting shadows throughout the day. ❚ Interlocking circles and abstract cacti imagery tie the design to the Arizona landscape. Project and PrecasT Concrete Scope ❚ Create a precast concrete cladding faÇade for a one-story religious temple. ❚ The project included 213 precast concrete panels. ❚ Precast concrete erection was completed in six months. HEALTH PARTNERS BLOOMINGTON PARKING STRUCTURE BLOOMINGTON, MINN. When Health Partners healthcare facility signed a new lease for its corporate headquarters in Bloomington, Minn., the extension allowed for significant upgrades, including a new, eight-level, all–precast concrete parking structure. The new ramp includes 1666 parking stalls to serve more than 2500 healthcare employees who work on the campus, giving them an easier, safer, and more accessible parking solution. The new structure dramatically expands future growth opportunities for the mixed-use development, while shortening the distance employees have to walk from their cars. It also allows site owners to develop acres of impervious surface parking in the future. Precast concrete quickly emerged as the material of choice to meet the cost, schedule, durability, and expandability goals for the ramp. Photo: Wells Concrete. Key Project Attributes ❚ Interior load-bearing light walls are used on the exterior to add visual appeal and support future expansion. ❚ Reinforced concrete haunches were incorporated on both sides of the light wall so exposed bearing plates could be avoided. ❚ Insulated precast concrete sandwich panels allow the elevator tower to be enclosed and tempered while maintaining consistency with the rest of the open-air ramp. Project and PrecasT Concrete Scope ❚ Build an all–precast concrete, eight-story parking structure with opportunity for future expansion. ❚ Precast concrete elements included 2004 precast concrete pieces. ❚ Erection was completed in less than three months. PURPOSEFUL DESIGN From the early stages of design, the precast concrete fabricator, contractor, architect, structural engineer, and parking planners worked together to fashion a design that efficiently met the performance and design goals for the project. The efficiency of a simple box was embraced in conceptual design, and the team found an opportunity for variation and relief in the detailing of the panels. Sandblasted, acid-etched, and honed corbel finishes provide color and texture, while simple, framed relief in the casting beds adds reveals that cause light and shadow to shift throughout the day. The arrangement of panels with different finishes within the faÇades lends a purposefulness to the design, helping the structure to mesh with the overall campus development OWNER: and meld into the background despite its size. To McGough Development, inject further design appeal into the project withSt. Paul, Minn. out overshadowing neighboring structures, the PCI-CERTIFIED PRECAST CONCRETE PRODUCER: design team added a “light wall” component to Wells Concrete, Maple the exterior that provides a vertical expression of Grove, Minn. interlocking white corbels and contrasts with the wellsconcrete.com shades of grey in the horizontal panels. These verARCHITECT: BWBR Architects, tical elements also cover the sloping ramp floors, St. Paul, Minn. giving the exterior appearance a simple interplay ENGINEER OF RECORD AND PRECAST of vertical and horizontal lines. The resulting deCONCRETE SPECIALTY ENGINEER: Ericksen Roed & Associates, sign delivers a flexible, low-maintenance solution St. Paul, Minn. that can be expanded to accommodate future GENERAL CONTRACTOR: growth, while blending easily with the existing McGough Construction, St. Paul, Minn. infrastructure. Best Kept Secret Some experts call structural Welded Wire Reinforcement (WWR) the best-kept, time-saving, costcutting secret in the concrete reinforcement industry. But we can let you in on all the details. We are the Wire Reinforcement Institute—the world’s leading association of manufacturers, professionals, and allied industries engaged in the production and application of WWR. Where can I learn more about welded wire reinforcement? Find a nearby producer member plant, connect to an associate member, get the latest news, Tech Facts, Case Studies, videos and presentations on our website. Joining the Wire Reinforcement Institute is a smart, strategic choice for both companies and individuals in the concrete construction industry. WRI oﬀers a broad array of member services and a sliding dues schedule. Fabricators, precasters, building supply distributors, engineers, suppliers, architects, contractors, educators, and students are welcome. Need a course to add to your credentials? Have you used our app? Calculate wire size, wire spacing, deformed welded wire reinforcement splice. Available for iOS, Android and Windows. Visit our website to connect to our latest courses. BY MARTY MCINTYRE, PCI FOUNDATION The faculty at University of Arizona (UA) in Tucson had the opportunity to propose a precast studio for their campus. They saw it as the perfect opportunity for the Department of Civil Engineering and the College of Architecture, Planning and Landscape Architecture to work together on an integrated program. The timing was perfect, as the school was enrolling students into its new architectural engineering program who could “grow up” with the precast concrete program. The PCI Foundation program at UA will be one of the first to eventually offer courses across several departments with multiple faculty working together on buildings, bridges, and other precast concrete structures. The program will prepare students to either work in the precast concrete industry or design structures for a variety of other industries using precast/prestressed concrete products wisely and efficiently. Students from University of Arizona visit Coreslab as part of their PCI Foundation program. Photo: University of Arizona. Register today for the architecture & design event of the year! Taking students out of the classroom and getting them to the precast concrete plant for experiential learning is one of the highlights of the University of Arizona program. Photo: University of Arizona. Working with Precast Concrete Plants The school has been working with Coreslab Structures (ARIZ) to ensure that students have hands-on experiences and the ability to learn by doing. Coreslab’s Phil Richardson has been giving lectures and arranging plant tours. Students will also visit a variety of company plants and worksites to give a well-rounded view of the precast, prestressed concrete building and design industry. The UA PCI Studio field trip program will include precast concrete plant tours, construction site visits, specialty product supplier tours, and design consultant visits for structural/ architectural firms. In the other semester, field trips will be offered to other associated plants, suppliers, and architectural precast concrete firms. Field trips to local construction projects using precast concrete—buildings, parking structures, and stadiums— will be identified and scheduled on a case-by-case basis, using the Precast Industry Champion and local construction companies, such as Sundt, for information on their upcoming projects. Finally, field trips will be scheduled to local structural and architectural design firms using precast concrete. To learn more about the PCI Foundation, visit pci-foundation.org. Email Marty McIntyre, executive director, at martymci@pci-foundation.org. of black and gray tones were selected to help achieve both dark and light mixes. All panels had to coordinate with Stresscon’s structural precast elements. The 2-in.-thick ARCIS panels feature an acid etch finish exposing carefully selected integral aggregates for texture and architectural detail. The building features various panel sizes to incorporate consistent panel lines in the design pattern of the architectural skin. Of the projects 168,885 square feet of exterior wall area, 11% is composed of ARCIS panels. PCI Continuing Education PCI is a registered continuing education provider with the American Institute of Architects (AIA), and the National Council of Examiners of Engineers and Surveyors (NCEES). PCI also has registered programs with the International Code Council (ICC). PCIâ&#x20AC;&#x2122;s educational offerings include a variety of programs to fit your schedule and preferred learning environment, such as webinars, seminars, lunchand-learns, and online education. To learn more, visit pci.org. PCI conducts lunch-and-learn presentations and seminars on an ongoing basis. U P C O M I N G W E B I N A R TO P I C S I N C L U D E : April 30, May 2: How Precast Builds Award Winning Parking Structures Other upcoming topics: H  ow Precast Builds Award Winning Bridges Working with FEMA in Building Precast Concrete Storm Shelters >	PCI ELEARNING CENTER The PCI eLearning Center is the first education management system dedicated to the precast concrete structures industry. This free 24-hour online resource provides an opportunity for architects and engineers to earn continuing education credits on demand. Each course includes a webinar presentation recording, reference materials, and a quiz. Quality Control Schools Level I-II AU ST I N , T E X . Level I Only P RO D U C T I V I TY TO U R - S AC R A M E N TO, C A L I F.
Level III AU ST I N , T E X . Visit pci.org/schools or pci.org/events for more information and to register. > L E V E L I Q UA L I TY C O N T R O L S C H O O L L I V E O N L I N E PCI offers training for quality control technicians to prepare individuals for PCI personnel certification examinations. Visit pci.org/online-academy for details. >	LUNCH-AND-LEARNS PCIâ&#x20AC;&#x2122;s lunch-and-learn/box-lunch programs are a convenient way for architects, engineers, and design professionals to receive continuing education credit without leaving the office. Industry experts visit your location; provide lunch; and present on topics such as sustainability, institutional construction, parking structures, aesthetics, blast resistance, the basics of precast, and many more. Visit pci.org/LearnAtLunch for a list of lunch-and-learn offerings and to submit a program request. 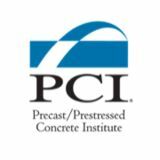 PCI develops, maintains, and disseminates the Body of Knowledge for designing, fabricating, and constructing precast concrete structures and systems. It is from this Body of Knowledge that building codes, design guides, education, and certification programs are derived. Please visit pci.org/design_resources for all of these design resources and more. Architectural Precast Concrete Color and Texture Selection Guide, 2nd Edition (CTG-10) The “Architectural Precast Concrete—Color and Texture Selection Guide” has been reprinted with 12 new color and texture pages, plus identification pages with mixture designs. This includes nine new color pages with two new colors per page, two pages of new formliners, and one page of new clay brick-faced precast. The numbers in the guide have not been changed, so that there is no confusion between the old and the new versions. This is a visual guide to assist architects in the initial selection of color and texture for architectural precast concrete. Illustrating more than 500 colors and textures for enhancing the aesthetic quality of precast concrete panels, the guide is an extension of the information included in the architect-oriented Architectural Precast Concrete manual (MNL-122). Cements, pigments, coarse and fine aggregates, and texture or surface finish with various depths of exposure were considered in creating the 287 6.75- by 11-in. color plates, the majority of which display two finishes on the same sample. The materials used to produce the samples are identified in the back of the guide for handy reference. The three-ring binder has removable inserts. Architectural Precast Concrete, 3rd Edition (MNL-122) This fully revised edition includes new sections on sustainability, condensation control, and blast resistance. You’ll get extensive updates in the areas of color, texture, finishes, weather, tolerances, connections, and windows, along with detailed specifications to meet today’s construction needs. Includes full-color photographs and a bonus DVD. Precast Prestressed Concrete Parking Structures: Recommended Practice for Design and Construction, 3rd Edition (MNL-129-15; e-pub) Decades of research have proven that precast, prestressed concrete is a cost effective, durable solution for parking structures. Over 140 pages present the latest concepts in design and construction, including 16 pages of full-color photography and many details and design examples. This is the most comprehensive publication of its kind. Designer's Notebooks – Free The PCI Designer’s Notebooks provide detailed, in-depth information on precast concrete relevant to specific design topics such as acoustics, mold, and sustainability. Visit pci.org for the most up-to-date listing of PCI-certified plants. When it comes to quality, why take chances? When you need precast or precast, prestressed concrete products, choose a PCI-Certified Plant. You’ll get confirmed capability—a proven plant with a quality assurance program you can count on. Whatever your needs, working with a plant that is PCI-certified in the product groups it produces will benefit you and your project. •	You’ll find easier identification of plants prepared to fulfill special needs. •	You’ll deal with established producers—many certified for more than 30 years. •	Using quality products, construction crews can get the job done right the first time, keeping labor costs down. •	Quality products help construction proceed smoothly, expediting project completion. Precast or precast, prestressed concrete building elements such as exterior cladding, load-bearing and nonload-bearing wall panels, spandrels, beams, mullions, columns, column covers, and miscel­laneous shapes. This category includes Category AT. These products are the same as those in the categories within Group B, but they are produced with an architectural finish. They will have a form, machine, or special finish. Certification for Group BA production supersedes Group B in the same category. For instance, a plant certified to produce products in Category B2A is also certified to produce products in Categories B1, B1A, and B2 (but not certified to produce any products in B3A or B4A). The PCI Plant Certification Program is focused around four groups of products, designated A, B, C, and G. Products in Group A are audited to the standards in MNL–117. Products in Groups B and C are audited to the > G R O U P C – C O M M E R C I A L ( ST R U C T U R A L ) standards in MNL–116. Products in Group G are audited C AT E G O RY C 1 – P R E C AST C O N C R E T E P RO D U C T S according to the standards in MNL–130. The standards Mild-steel-reinforced precast concrete elements including sheet piling, pile caps, piling, retaining-wall referenced above are found in the following manuals: elements, floor and roof slabs, joists, stairs, seating mem­bers, columns, beams, walls, spandrels, etc. •	MNL–116 Manual for Quality Control for Plants and Production of Structural Precast Concrete C AT E G O RY C 2 – P R E ST R E S S E D H O L LOW- C O R E A N D R E P E T I T I V E P RO D U C T S Products Standard shapes made in a repetitive process prestressed with straight strands. Included are hollow•	MNL–117 Manual for Quality Control for Plants core slabs, railroad ties, flat slabs, poles, wall panels, and products in Category C1. and Production of Architectural Precast Concrete C AT E G O RY C 3 – P R E ST R E S S E D ST R A I G H T- ST R A N D ST R U C T U R A L M E M B E R S Products Includes stemmed members, beams, col­umns, joists, seating members, and pro­ducts in Categories C1 and C2. •	MNL–130 Manual for Quality Control for Plants and Production of Glass Fiber Reinforced Concrete C AT E G O RY C 4 – P R E ST R E S S E D D E F L E C T E D - ST R A N D ST R U C T U R A L M E M B E R S Products Includes stemmed members, beams, joists, and products in Categories C1, C2, and C3. Within Groups A, B, and C are categories that identify G RO U P C A – C O M M E RC I A L P RO D U C T S W I T H A N A RC H I T E C T U R A L F I N I S H product types and the product capability of the individual These products are the same as those in the categories within Group C, but they are produced plant. The categories reflect similarities in the ways in with an architectural finish. They will have a form, machine, or special finish. Certification for Group which the products are produced. In addition, categories CA production supersedes Group C in the same category. For instance, a plant certified to produce in Groups A, B, and C are listed in ascending order. In products in Category C2A is also certified to produce products in C1, C1A, and C2 (but not certified other words, a plant certified to produce pro­ducts in to produce any products in C3 or C4A). Category C4 is automat­ically certified for products in the preceding Categories C1, C2, and C3. A plant cer­tified > G R O U P G – G L AS S - F I B E R - R E I N F O R C E D C O N C R E T E ( G F RC ) to produce products in Category B2 is automatically These products are reinforced with glass fibers that are randomly dis­persed through­out the product and are qualified for Cat­egory B1 but not Categories B3 or B4. made by spraying a cement/sand slurry onto molds. This pro­duces thin-wal­led, lightweight cladding pan­els. Visit pci.org for the most up-to-date listing of PCI-certified erectors. When it comes to quality, why take chances? When you need precast or precast, prestressed concrete products, choose a PCI-Certified Erector. You’ll get confirmed capability with a quality assurance program you can count on. Whatever your needs, working with an erector who is PCI-certified in the structure categories listed will benefit you and your project. •	You’ll find easier identification of erectors prepared to fulfill special needs. •	You’ll deal with established erectors. •	Using a PCI-Certified Erector is the first step toward getting the job done right the first time, thus keeping labor costs down. •	PCI-Certified Erectors help construction proceed smoothly, expediting project completion. > C  AT E G O RY S 1 – S I M P L E ST R U C T U R A L SYST E M S This category includes horizontal decking members (e.g. hollow-core slabs on masonry walls), bridge beams placed on cast-in-place abutments or piers, and single-lift wall panels. > C  AT E G O RY S 2 – C O M P L E X ST R U C T U R A L SYST E M S This category includes every­thing outlined in Category S1 as well as total–precast, multiprod­uct struc­tures (vertical and horizon­tal mem­bers com­bined) and single- or multistory load-bearing mem­bers (including those with architec­tural finishes). > C AT E G O RY A – A R C H I T E C T U R A L SYST E M S This category includes non-load-bearing cladding and GFRC products, which may be attached to a support­ing structure. for the 2019 PCI Committee Days and Technical Conference, Featuring The National Bridge Conference on September 25-28, 2019. Participate in the decisions driving our industry and impacting your business. Grow your industry knowledge with peer reviewed and non-peer reviewed education sessions. Network and get to know our industry’s leaders and spend time with your peers. loads flowed directly to the ground and were not tied to the steel frame. Almost every piece of the front entrance façade is unique. This very complicated project presented a challenge that required an innovative solution using technical, engineering and creative expertise, and would not have been possible without the use of BIM and 3D modeling. For more information on this project and others visit us at www.highconcrete.com/news.